Stamford, CT – Dr. Edward Shukovsky, a practitioner of dentistry in Stamford, who has extensive experience treating people with sleep apnea, says that Temporomandibular Joint Disorder (TMD) and sleep apnea are more related than one might think. The steps dentists take to evaluate a patient for either condition are quite similar. 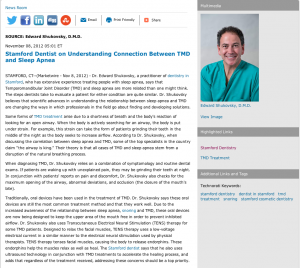 Dr. Shukovsky believes that scientific advances in understanding the relationship between sleep apnea and TMD are changing the ways in which professionals in the field go about finding and developing solutions. Some forms of TMD treatment arise due to a shortness of breath and the body’s reaction of looking for an open airway. When the body is actively searching for an airway, the body is put under strain. For example, this strain can take the form of patients grinding their teeth in the middle of the night as the body seeks to increase airflow. According to Dr. Shukovsky, when discussing the correlation between sleep apnea and TMD, some of the top specialists in the country claim “the airway is king.” Their theory is that all cases of TMD and sleep apnea stem from a disruption of the natural breathing process. When diagnosing TMD, Dr. Shukovsky relies on a combination of symptomology and routine dental exams. If patients are waking up with unexplained pain, they may be grinding their teeth at night. In conjunction with patients’ reports on pain and discomfort, Dr. Shukovsky also checks for the maximum opening of the airway, abnormal deviations, and occlusion (the closure of the mouth’s bite). Traditionally, oral devices have been used in the treatment of TMD. Dr. Shukovsky says these oral devices are still the most common treatment method and that they work well. Due to the increased awareness of the relationship between sleep apnea, snoring and TMD, these oral devices are now being designed to keep the upper area of the mouth free in order to prevent inhibited airflow. Dr. Shukovsky also uses Transcutaneous Electrical Neural Stimulation (TENS) therapy for some TMD patients. Designed to relax the facial muscles, TENS therapy uses a low-voltage electrical current in a similar manner to the electrical neural stimulation used by physical therapists. TENS therapy tenses facial muscles, causing the body to release endorphins. These endorphins help the muscles relax as well as heal. The Stamford dentist says that he also uses ultrasound technology in conjunction with TMD treatments to accelerate the healing process, and adds that regardless of the treatment received, addressing these concerns should be a top priority. Dr. Edward Shukovsky is a graduate of the University of Pennsylvania School of Dental Medicine. He has attended cosmetic dentistry programs from the Hornbrook Group as well as the Aesthetic Masters and continues to stay abreast of the latest dental technologies and techniques for the benefit of his patients. He leads the Dental Practice of Edward Shukovsky, D.M.D. in Stamford, Connecticut and is affiliated with the American Dental Association, the Connecticut State Dental Association, the Stamford Dental Society, the American Academy of Cosmetic Dentistry, the American Academy of Dental Sleep Medicine, and the Dental Organization for Conscious Sedation. To contact the Dental Practice of Edward Shukovsky, visit their website at smilesct.com or call 203-428-4487. The center’s office is located at 1290 Summer Street, #3400, Stamford, CT 06905. The center’s Facebook page can be found at facebook.com/pages/Edward-Shukovsky-DMD/117291921637556?v=wall.